On the 40th anniversary of the release of The Saints’ classic album ‘(I’m) Stranded’, founding member, guitarist and songwriter Ed Kuepper will revisit the material performed by that seminal band from an era when a suburban Brisbane band took their sound to the world. 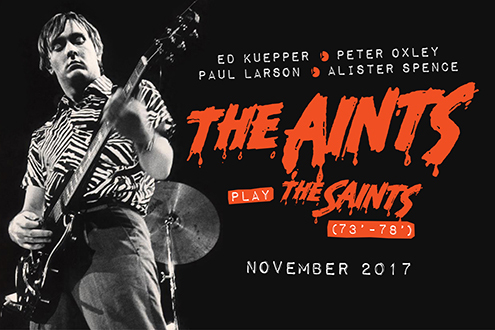 Alongside bassist Peter Oxley (Sunnyboys), drummer Paul Larson (The Celibate Rifles), keyboardist Alister Spence and a guest brass section ‘The Aints’ will perform the songs that spanned The Saints first three ground-breaking albums: the proto-punk classic ‘(I’m) Stranded’ (1977), the hugely influential ‘Eternally Yours’ (1978), and the genre-defying ‘Prehistoric Sounds’ (1978). Tickets for ALL shows on-sale Monday June 19th. Special guests: Harry Howard & The NDE. plus Harry Howard & The NDE + The Holy Soul. Tickets on-sale Friday September 1st via aussieworld.com.au and all oztix outlets.